Many educators won't agree, but perhaps students will: The PC, whether desktop or notebook, is obsolete in the classroom. This reality, if accepted for what it is, presents Apple opportunity to retake the K-12 market from Alphabet-subsidiary Google's incursion and sudden success with Chromebook among U.S. schools. If the fruit-logo company doesn't seize the moment, a competitor will—and almost certainly selling devices running Android. Chromebook's educational appeal is three-fold: low cost, manageability, and easy access to Google informational services. For buy-in price, and TCO, no Apple laptop or tablet running macOS or iOS, respectively, can compete. Think differently! Providing students any kind of computer is shortsighted, by narrowly presuming that schools, or their parents, must buy something. I suggest, in this time of budgetary constraints, that educators instead use what the kids already possess (or want to) and what they use easily and quickly: The smartphone. To reiterate: This quality makes the smartphone spatial—3-dimensional—compared to Chromebooks running flat apps that are comparatively singular in utility. Same rationale applies to lower-cost Windows PCs. The app advantages and familiarity to students are potentially more expansive if allowed to be. Chatting, texting, and sharing are first nature to many young smartphone users. Apple's iOS—and likewise Google's Android—provides platform and supporting app ecosystem that encourages creative mashups and sharing. Consider the student who easily can capture and combine audio, photos, and video on a smartphone for a homework assignment—and do so much more easily than on a Chromebook. The apps and platform utility are there, and the computer in the kid's pocket is likely faster, as well as being more adaptable and productive. Who is going to learn more? The student pursuing personal interests or the one pursued by flat, curriculum computing? The creative (and revenue) opportunities for app developers could be a boon for learning. Imagine Niantic releasing an educational version of Pokemon Go that leads middle schoolers on learning adventures in controlled environs like the building's gymnasium. Why shouldn't gaming be educational and fun—or popular? Apple would need to develop educational controls, extended from their parental counterparts, for iPhone. Imagine the supervisory advantages that managed location-servies could present, for example. Did Johnny skip school? The principal can find him. Is Jackie in the girl's room when she's supposed to be in the chem lab? The teacher knows. Is there a shooter scare? Administrators could locate students quickly during and following the crisis. The building's WiFi network would be used for accurate, pinpoint location. The educational controls could also separate home and school spaces. During the last decade, Nokia phones demarcated professional and personal home screens and apps. Apple should provide similar utility. Connected to the school's WiFi network and during the class day, students would be locked into the educational environ; they could choose which, otherwise. Circling back to the nut graph, let's talk costs and acquisition. U.S. schools typically buy laptops—the majority of them Chromebooks in 2015-16, according to combined analyst data—for students; sixth graders upwards are often the biggest beneficiaries. 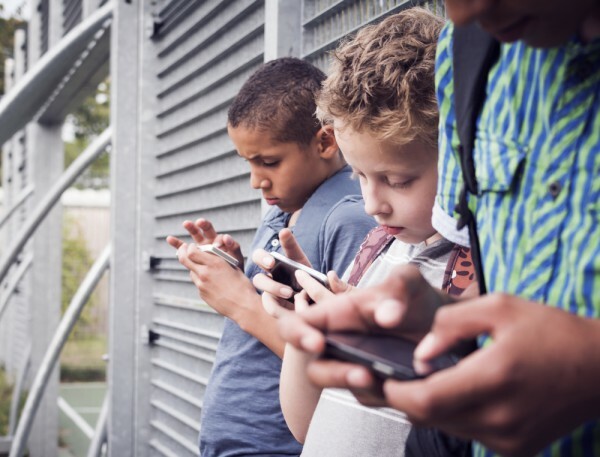 Many of these same kids already own smartphones—a stunning three quarters of American teenagers, according to eMarketer and Pew. When narrowed to the total population of U.S. smartphone users (79 percent), 84 percent of 12 to 17 year-olds have the devices, eMarketer finds. Also: Forty-one percent of kids age 11 and younger. Apple's problem: Not all kids will have smartphones and many may run Android. Nevertheless, there's a bumper crop to harvest. According to Piper Jaffray's "Taking Stock With Teens" twice-yearly report, which most recently released in mid-october: 74 percent of American teenage smartphone owners use an iPhone. Problem: The company that once ungrammatically told people to "Think Different" needs to think differently. Perusing Apple's U.S. higher educational store, Macs and tablets are sold, but no iPhones. The comoany's U.S. Education Institution Hardware and Software Price List, current as of Nov. 9, 2016, also doesn't include iPhone—although cases are available aplenty! The point: iPhone for education isn't on Apple's radar, but it should be. iPhones won't cost as little, but a larger number of students or parents might want them more than the Chrome OS laptops. Three quarters of teens say their next cellular handset will be an iPhone, according to Piper Jaffray. Desire must count for something. That's where financing can make the difference, particularly if students are offered a version of Apple's iPhone Upgrade Program. The consumer program lets someone pay $32.41 monthly for 32GB iPhone 7, including AppleCare+ repair warranty. Twelve months later, the leasee can trade in the device and get the newest available model. One-year, financed lease cost before tax would be $388.92. Surely Apple could offer lower-cost financing and/or leasing options to schools or their students, with the goal of regaining educational customers being more important than harvesting fat margins. Investing in kids' futures also invests in Apple's. I don't suggest that any of this will be easy. School districts will resist, as many did evaluating Chromebook and later piloting deployments. Fine details matter with respect to device management, educational apps, and logistical and legal boundaries between an institution and the student. But none these things is insurmountable, if my basic premise is sound: That an iPhone, or other smartphone, is a better learning/teaching tool than is Chromebook.